‘Leac-na-Gillean‘ is remembered in the traditions of lochs as the geographical feature where the Press-gang put 32 young local men on board small boats against their will and ferried them out to a waiting warship that was hiding behind the Island of Tabhaid at the mouth of Loch Erisort. Subsequently 12 of them returned but 20 of them were never seen again. 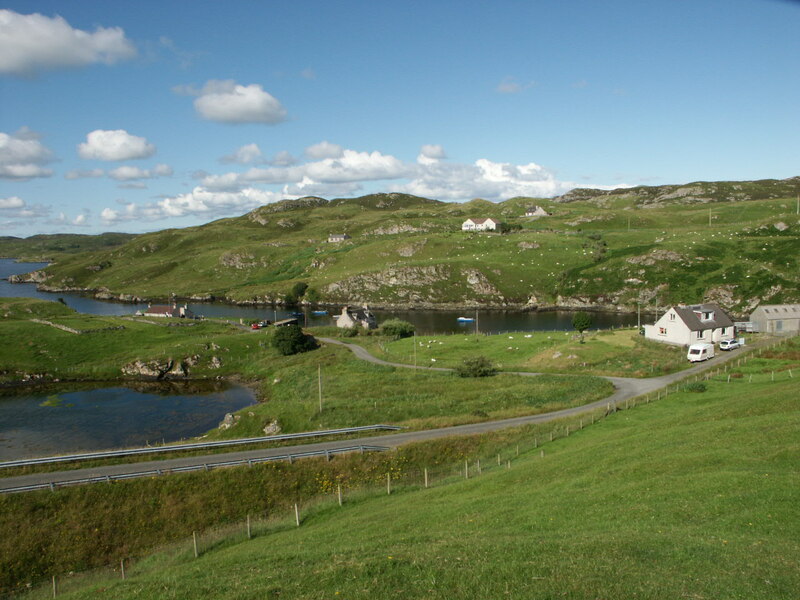 Leac-na-Gillean is at Swordale bay near Keose on the southern shores of Loch Leurbost. It was at Swordale Keose that the first Presbyterian Parish Church for the whole of the Parish of Lochs was built in 1724, and about the turn of the 18th/19th centuries, the church and manse buildings were moved up to the village of Keose. The new church stood where the Seaweed Factory was sited and the manse may still be seen at Glebe, Keose where it is used as a dwelling house. According to tradition the young men were lured into a trap under false pretences by causing them to enter the old parish church building at Swordale where the hated press gang were lying in wait for them, either within the church or nearby, ready to pounce on them and carry them away and enlist them in one of the armed services, probably the Navy seeing a warship was used. Local tradition give two dates for this event 1802 and 1808 and furthermore it was said that it was during the ministry of Rev. Alexander Simpson the Parish Minister who was at Lochs from 1793 to 1830 which was during the time of the Napoleonic Wars, that the young men were taken. One source give the dates of the building of the new church and manse as 1796 for the church and 1800 for the manse, but we have seen slightly later dates given, 1808 seems rather late as the date of the Press Gang, as the new church was probably in use by then. On the other hand the old thatched church might have been used on occasion as well. It is implied that Rev. Alexander Simpson was involved in the luring of the young men to the church and that whiskey played a part, but we would expect folk-lore to add colour to the event and no one knows what, if any part the well known minister played in the episode. A late Crossbost Free Church Minister seemed to be well aware of the details of the event, but unfortunately we do not know if he could identify any young men that were involved in the event. Some Keose sources are inclined to think that possibly some or all of the men were in the North Lochs area rather than the Kinloch area. We would be grateful for any more information about the 32 young men. Customs associated with marriage continue to evolve and fascinate. The following extract is taken from the writings of the late Angus ‘Ease’ Macleod of South Lochs and describes typical rural weddings in the early part of the 20th century. .
“Weddings were one of the highlights of the winter social round. Most of the weddings were celebrated at home with an all night barn dance. Sometimes the dance was held in the school if it was convenient. The wedding celebrations extended over a period of weeks, beginning with the betrothal party (reiteach) or engagement party at the home of the bride. Then the preparations for the wedding feast, when all the neighbouring women and some of the men were on hand to carry out any chores that were to be done, including the preparation of large quantities of food for the wedding feast. After the wedding was celebrated in the time-honoured fashion, there was the house warming party (banais-taigh), which was exclusively for the neighbouring senior citizens. Some weddings took place at the east coast fishing ports. Practically all the young people, male and female following the herring fishing found it convenient to get married at the end of the fishing season. On occasion, boy met girl at the fishing for the first time and one of the parties might be from another area of the island or further afield. On one occasion in the early 1850s three men from Marvig married girls from Sutherland at the Wick fishing. They married in Sutherland at the end of the summer fishing season and the brides came home to Marvig along with their husbands on the fishing boats. At that time it was customary for Lewis fishing boats to go to the Caithness herring fishing every summer. The three girls married were Barbara MacDonald from Bettyhill who married Donald Maclennan of 6 Marvig who moved to 26 Lemreway later on, and her sister Betty MacDonald, who married Alistair MacFarlane of 10 Marvig. The third girl was Jean Munro from Melvich who married Roderick Finlayson of 8 Marvig. They all raised large families in Lochs. Murdo Matheson from Gravir, South Lochs was well-known throughout Lewis as the entertainer Cailleach an Deacoin. The name Murdo Matheson doesn’t instantly conjure up any particular images in the mind, but mention the name ‘Cailleach An Deacoin‘ and you can be assured that a smile and a chuckle of remembrance will emerge from your audience. Born on the 4th January 1904 Murdo Matheson was the seventh child of a family of 13, in the village of Gravir, Pairc. He went to school like most of his contemporaries at that time where he faired averagely. He left at the age of 14 to seek employment. Between the ages of 15 and 18 he held a variety of jobs including kipper making and road building. Around 1925, Murdo decided to emigrate to Canada and was due to sail on the ‘Marloch’ but contracted measles which delayed his passage. Luckily for him he was able to travel a fortnight later. Several years were spent there where he laboured on farms. However, his luck was to change when he heard that there was good money to be made working on the production line of a motorcar company called ‘Briggs Bodies’ in the American city of Detroit. Three and a half years old and about to have my first remembered memory of our annual holiday on the Hebridean island of Lewis, isle of the heather and ‘land of my fathers’. Three o’clock in the morning with myself seated on our cabin trunk, wearing my new white tammy resplendent with long white tassel – my pride and joy. Excited. We were a family of five, my parents, my sister, my brother and me. We awaited the arrival of the Glasgow taxi, which was to take us to Buchanan Street Railway Station, where the ‘Great adventure’ would begin….. The 4.15 train for Mallaig arrived and with lots of other passengers and a proliferation of cases and more important things like fishing rods, we clambered aboard. Three to four hours later and half-asleep, we left the train to walk across to Mallaig harbour. There was the steamer which was to transport us north to Kyle of Lochalsh – a journey of some 2/3 hours. Warm and sunny weather and warm enough to be on deck, open up our flasks and sandwiches and have a late lunch. Sail over and we were now on the pier at Kyle. We would wait with our luggage until the ‘Sheila’, the Stornoway steamer, would dock. Another hour would pass as cargo and luggage preceded the passengers and rucksacked tourists were allowed on board. The sea breeze had become a stiffening wind by this time, threatening to ‘de-tammy’ me. I have this memory of great anxiety about this. by Angus ‘Ease’ Macleod, Calbost and Marybank. Even now, more than a century after the event, the people of Lochs still talk about the body that was discovered in Southern Park on 2nd August 1887. The body, and his grave, are normally referred to as that of “the stowaway” or “the fireman” to this day, and there are only a few people still left in Lochs who know the story of the stowaway. However, his death is registered and there is no doubt that such a person existed, even though the details of who he was or where he came from is not known. His death is noted in the register on January 1888 as an unnamed man about 30 years old whose body was found at “Colbal Hill” in Southern Park on 2nd August 1887. He is referred to as “the fireman”. At that time people were under the impression, rightly or wrongly, that the law of the land required that human remains be buried near where they were found. Probably that is why there are single graves to be found here and there. There is a grave on the writer’s croft called “Donald’s grave” and no one knows who Donald was. It is said that Joseph Platt who took over the tenancy of the sporting estate of Pairc in 1886 when the Park Sheep farm was converted into a Deer Park, made enquires with a view to identify the remains. He approached the Federation of Shipping to see if they knew of any ship that might have been in the vicinity of Pairc at that time. They were not aware of any ships being there and in the circumstances Mr Platt provided a coffin for the remains and gave it a decent burial where he was found, not far from Buthinish/Gearraidh-Riaghsaigh near the southern shore of Loch Shell, not far from the Black Burn. The grave is marked with two cairns of loose stones, one at each end of the grave. The place is well known to gamekeepers and others who move about that district. It was from Cluthar in Harris that the Mackinnons on my father’s side came. Domhnull Mhaoil Domhnaich came to work in Crobeg. 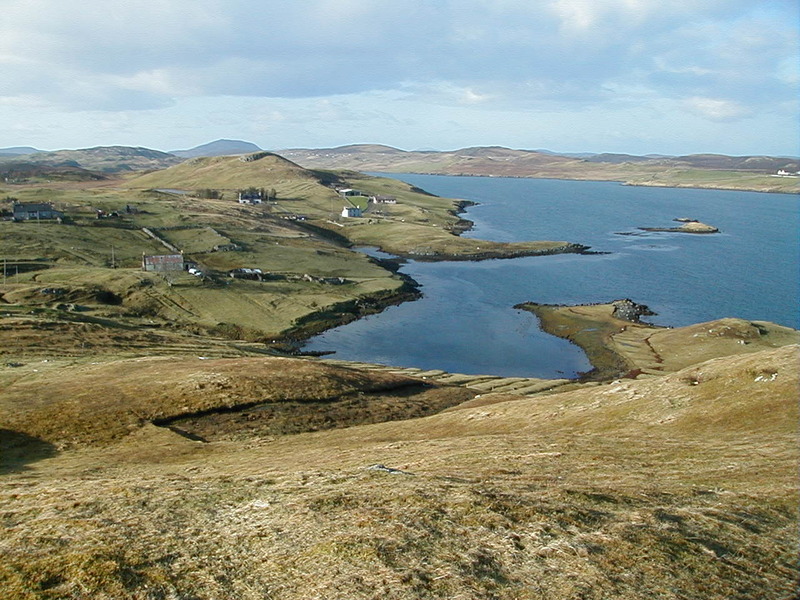 At that time, Caversta, Torostay, and Orinsay belonged to Crobeg. When crofts were allocated in Caversta, one of Domhnull’s sons, Ruairidh (my grandfather) got No 4. I remember an old ruin in Caversta on croft 2 that belonged to my grandmother’s family. It is known as “Tobhtag Nic Ailean”. Anna Macsween was her correct name. She also worked in Crobeg. She originally came from Harris. I remember the ruin still with a roof on it. Many an hour myself, Nobles and Louis Fhearchair spent there. It was there that the local bull was kept. Many a night I tumbled over him making my way home in the dark. If they had not brought him in, he would lie on the road that was going down to our house. Anna Macsween was a poor woman. I remember my father saying that when the men were landing their catch from fishing, that her share would be allocated before the share of the crew. There was another lady in Caversta called Raonaid, but she must have been there long before Anna, as her ruin had fallen down in my time. There was another man in Caversta called Fearchair. He had a big house. It was built during the time of the fishing. It was Ruairidh Cubar from Keose that built it. They had collected all the stones for it before they left for the fishing, and the house was built by the time they came back. He got paid around four pounds for building it. I have never seen such beautiful stonework; he was a wonderful stonemason. He was well respected in those days. The house was about thirty feet long, and had a stair in it as well. Fearchair had a big family of ten, and some of them are still living. Kirsty agus Alastair, Gubh Gradh Innleachd – as told by Angus Macleod, Calbost and Marybank. Usually there was a moral to the stories told in the village Ceilidh House and romance had a prominent place on the agenda. The following story is true…. In the mid 1850s parents took a keen interest in their daughters’ choice of a prospective husband and if he did not meet with their approval, they withheld their consent to marriage, and very often nominated a candidate of their own choice. Usually the young ladies had no alternative but to suppress their amorous feelings and gracefully accept the choice of their more mature and wise parents? Obviously it worked well because divorce was unknown. Some of the young ladies however, had a mind of their own and they were not always prepared to accept their parent’s choice. One such young lady was 21 year old Kirsty Macaskill, 17 Gravir, who was born in 1836 (Kirsty Dhomhnuill-a-Phiobair) she was not prepared to substitute her own lover, Alistair Macleod, Marvig for her parent’s choice of Norman Matheson, Gravir, nicknamed ‘Cigar’. Her parents, and particularly her mother, Anna Bard, who was a formidable lady, a daughter of Iain Mhurchaidh Bhard, Gravir, forbade Kirsty to associate with Alastair from Marvig anymore. Undaunted by the opposition of her large family of both parents and her six brothers, (her two sisters, Mary and Margaret were on her side). She and Alastair set about secretly planning to elope and be married at the nearest Church at Crossbost in 1856. As there were no roads in Lochs at that time they needed to arrange for a boat and crew to take them to Crossbost. Kirsty would also need to plan her escape from home without raising undue suspicion and it was here that she needed the cooperation of her 24 year old sister Mary who was unmarried and living in the family home. Her older sister, Margaret who was born in 1831, was already married to Alastair Maclennan, Alastair Dhonnachadh, 18 Marvig. It was customary at that time for young folk to go to the peat banks on the moor daily, first thing in the morning to bring home a creel or bag of peats because there were no roads and no tractors. Kirsty and Mary were in the habit of going to the moor for creels of peats each morning, and they conspired to pass out secretly, some of Kirsty’s clothes through the bedroom window (unnag-na-culaist) each morning to the other girl who would hide the clothes in her creel and carry them out to the peat-stack on the moor, awaiting the appointed day of elopement. When eventually, all the arrangement were ready, including Kirsty’s clothes, and a boat and a stalwart crew of young Marvig men, ready waiting at the departure point at Leck-Dubh with Marvig Bay, the girls got up early as usual and went off with their creels to the moor, ostensibly for the usual daily quota of peats, only this time they knew they were going to race over the moor to Marvig where Alastair and his team were waiting to whisk the Bride and Groom off in a boat to Crossbost Church to be married by Rev Robert Finlayson Free Church Minister of Lochs. A woman known locally as ‘Lady Habost’ or ‘A Bhan Tighearna‘ existed and lived in a fine house where croft 13 Habost is now. She was not an officially titled lady, but the grand-daughter of John Macleod (lain Mhic Thorcuill), tacksman of Hacklete in Bernera, Lewis. John Macleod had a son by the name of Donald who was known as ‘Donald of Lewis’. He had at least two sons and three daughters, John, Donald, Christianne, Mary and Barbara. 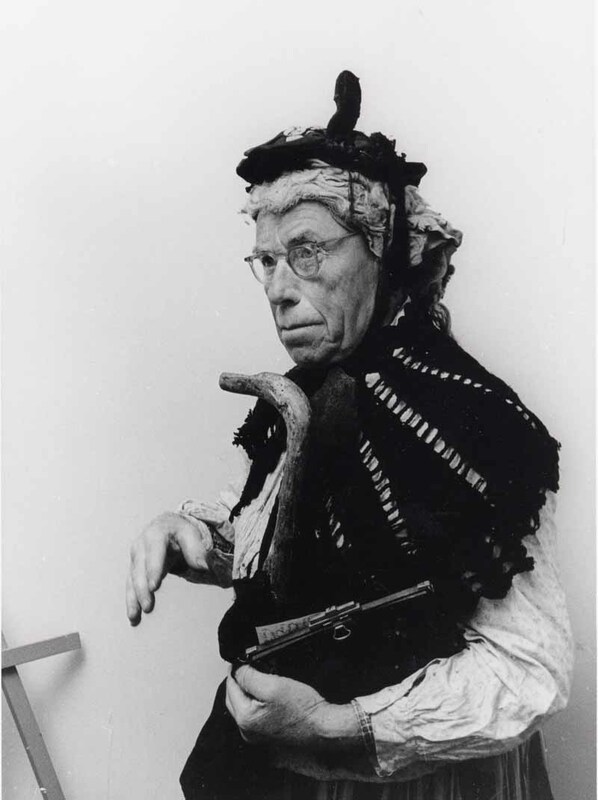 It was Barbara who was known as Lady Habost. She married Angus ‘Ruadh’ Smith, Sheildinish, who was born in 1736, and he entered upon the tenancy of the joint tack of Habost and Cleitir in 1775. Barbara’s brother, John Macleod of Colbecks, was a wealthy planter in Jamaica, and he left an annuity of £20 to Barbara, and each of his other two sisters. That was a considerable sum then and doubtless the local people felt that she was very well off, hence their reference to her as ‘Lady’, because she was affluent and possibly generous. Local tradition associates Barbara ‘A Bhan Tighearna’ with a seafaring Captain, which might have been her brother who was the owner of ships that traded with overseas ports, even as distant as the Pacific. From time to time the Captain took his ship into Loch Erisort where he anchored and brought unusual things to Lady Habost. Tradition also speaks of the fine house Lady Habost had, and that the roof was covered with red tiles which the Sea Captain brought to Habost from his overseas trading. The story about the red tiles seems to gain credibility, if not confirmation, from the fact that fragments of red tiles were unearthed at the site of the house in Habost, Lochs, and some of them are preserved by John M. Macleod of 15 Balallan, a distant relative of Lady Habost. Local tradition also associates a Sea Captain with a subsequent tacksman at Habost, ‘Allan Mac a’ Mhinisteir’, thought to be Allan Morrison, possibly Allan’s brother who traded with distant overseas places. The inference is that there were at least two Sea Captains or more that frequented Loch Erisort. The alleged activities of one of these Sea Captains associates him with white slavery, as it was said that one of these ships sailed away with a ship load of Island girls on the pretence of obtaining employment for them on the mainland, but none of them were ever heard about again, except that two Lewis soldiers serving in India happened to meet a girl there who identified herself as a girl from Laxay who was detained in the house of the Indian Potentate. The tradition of white slavery could be true. W.C. Mackenzie in his book History of the Outer Hebrides, pp 477-78, describes how, in the 18th century, the Captains of emigrant ships searched systematically for passengers in every remote island, and kidnapping became a common occurrence. A vessel named ‘Philadelphia’ called at Stornoway, and the Master proceeded to kidnap boys off the beach and lock them up on board his ship without the consent of their parents or their employers. In her widowhood, Lady Habost moved to Balallan where her brother, Donald Macleod, had been tacksman. In a list of tenants at Balallan in 1808, she is entered as ‘Lady Habost’, but the name is deleted and substituted by another name, which might indicate that she may have died about that time.